You know what they say about the book being better than the movie? Well, the book is better than the movie. I love P.D. James. I read her mysteries years ago. But better than the stories of Dalgliesh and Cordelia Gray is her book The Children of Men, an apocalyptic story set in the near future that shows what might happen to society when humans stop reproducing. The Children of Men has strong Christian and pro-life themes, some reviewers say it is the Gospel of Luke in reverse and others have noted that there is a strong anti-Liberal theology theme. Regardless, its good stuff. Get this book for Christmas! 2 out of 3 bible scholars think that Scott Hahn's Catholic Bible Dictionary should be in Christmas stockings. 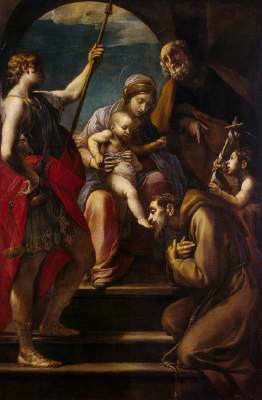 Well, I couldn’t very well put together a Catholic blogger list of recommended books and NOT have Scott Hahn, could I? I mean, they might take away my Catholic Blogger credentials. Oh yeah…I don’t have any. And look at these recos from the Amazon site! That’s like a roster pulled from Who’s Who in the American Catholic Church. Oh! I thought the title was The Search for God IN Guinness. My bad. So some of these posts just write themselves. This is one of those posts. It’s a book about God and Guinness. What do you mean, 'I can't sing'? I can sing! Okay, this is a book that I have wanted for a loooong time. Er…five years, according to Amazon‘s Wish List. Hmmm. Anyway, at the risk of getting all New Liturgical Movement-y on you, this is supposed to be an awesome and insightful book. 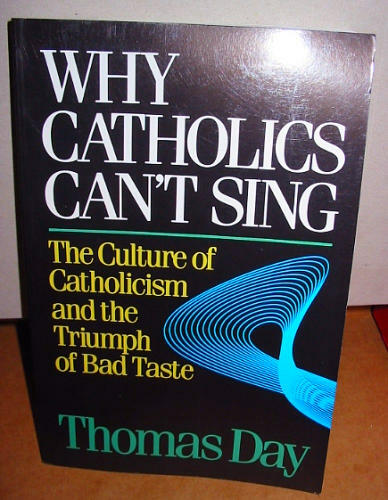 Why Catholics Can’t Sing: The Culture of Catholicism and the Triumph of Bad Taste by Thomas Day. I found the original review of the book from Catherine Dower on EWTN that made me add it to my Wish List –gosh, I love the internet! Adults--I have your readymade excuse: oh, I keep them around because I have nieces and nephews that visit. Are you a parent of young kids? Do you have children on your gift list? Have you lurched through your own childhood without experiencing the joy of reading Laura Ingalls Wilder? If you answered ‘yes’ to any of these questions, then today’s Tis the season…books! post is for you. 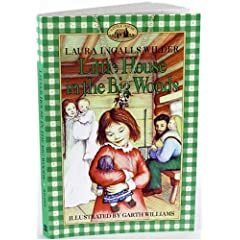 Laura Ingalls Wilder, if you did not know, wrote an autobiographical series of children’s books recounting her childhood in Wisconsin, Minnesota, Kansas and Missouri. You’ve no doubt heard of them because there was a moderately successful** television series based on them. Perhaps you may have a built-in bias against them, based on the old adage “familiarity breeds contempt” and if that is the case, I beg you to forget what you think you know and consider these books afresh. I remember reading them as a youngster myself, starting with Little House in the Big Woods, and loving them well before the tv series started. All my friends did. We got them from the library and I remember we had to swap them because there weren’t enough copies for us to read simultaneously. I admit that I re-read these a couple years ago when my son was reading them. What a pleasant re-read they were, too. I decided to recommend them after I chanced across this Catholic Exchange article which puts into context some of the politics behind Laura Ingalls Wilder’s publication of the books. Did you know or suspect that they were anti-New Deal? I didn’t but I can certainly see how they could be viewed that way. These books are about hardworking men and women, self-sufficient, industrious, family-centered, faithful, independent. Values that most parents want to pass on to their kids. Plus, the stories are really charming. If you don’t have kids that you can give these to, or if the kids live outside of your house (thereby denying you the ability to sneak in your own reading), then get yourself a copy! I also recommend that you buy the books as a set because keeping the titles straight and in order is just too darn difficult.